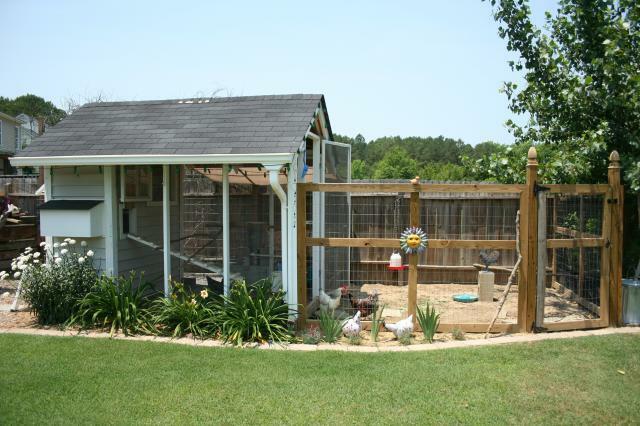 Skip forward to 2010... a few months back I revisited the idea after finding the BYC website again (I'd been browsing here before) and found from many wonderful members that you can have chickens in a confined coop/run area and not free range. I began plotting... trips to the library and a lot of time on BYC. DH was completely, adamantly, undeniably against the idea. I believe the words were "no, absolutely not". 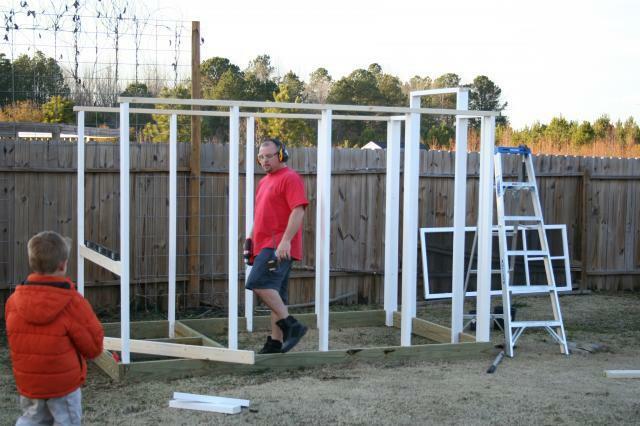 I held my ground and explained that this was something I wanted to do for me, for pets, for a hobby, for eggs, and it would be a great learning experience for our 5 year old son, and he (DH) would get to build something... I showed him some coops I particularly admired from your coops pages. 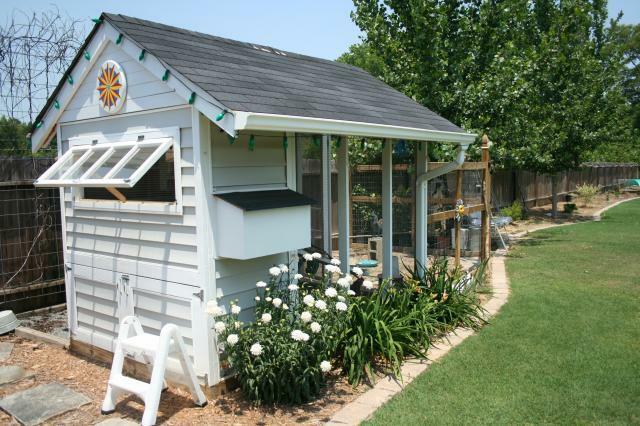 After looking with me (and knowing that a happy wife = a happy life) we have settled on a design/plan for a 6' by 10' covered coop/run, inspired by La Cage Mahal, Chick Mansion and La Cage de Poulet. 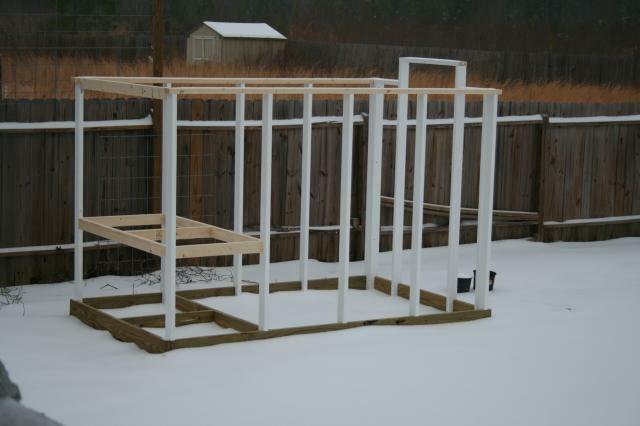 The goal is to build the coop and run BEFORE purchasing chicks in the late winter/early spring. Starting sometime in January... no official plan - w As promised... the base. 2x6 pressure treated since they are in contact with the ground. 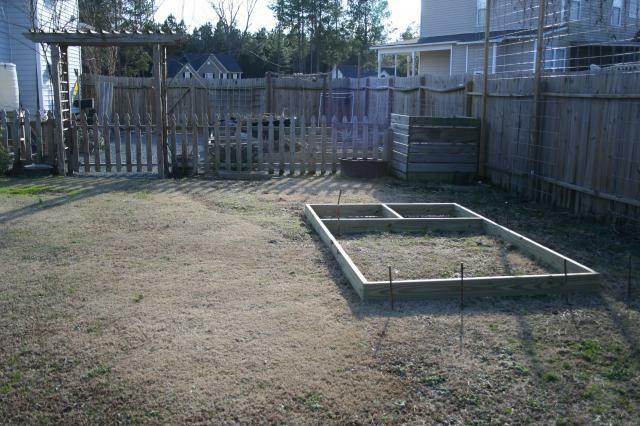 That's my raised bed garden in the background, and the wood box in the corner is my compost bin. The arbor has Queen Elizabeth climbing roses on it in the summertime. e're going for the "build as we go" method. Ahhhhhhhhhhhh... walls. 2x4's primed and painted. DH cut them to be about 6' tall. 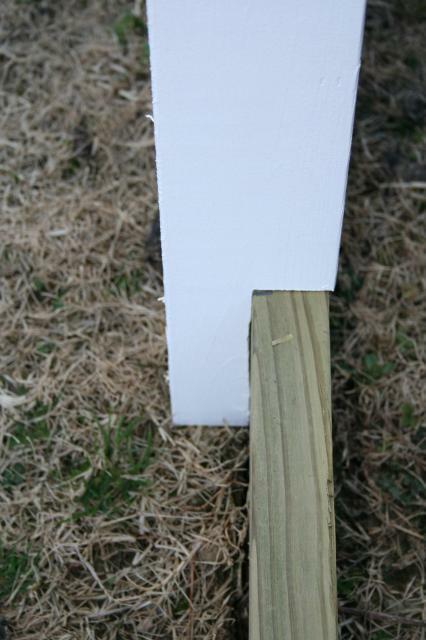 We notched out the bottom so they would fit into/over the 2x6 base and be flush along the outside. 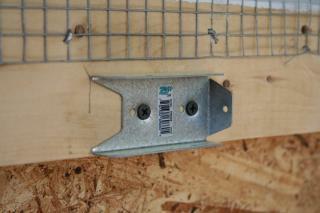 In hindsight, wish we'd put the notched 2x4's flush along the inside for easier installation of the hardware cloth. Lesson learned. For the human's entrance to the run, we found the screen door for the entrance for $9.00 on a clearance cart at the local home improvement store because the screen/spline had come out at one corner. Nothing a flat-head screwdriver couldn't fix; besides it's going to be covered with hardware cloth. Framed, and then... construction comes to a screeching halt due to snowstorm; not too common here in central North Carolina. It stuck around for 4-5 days, with rain following... then another 4 inches of snow 2 weeks later' another melt, then more snow! WHEN ARE WE GONNA GET BACK TO WORKING ON THIS THING?!?!? March 1st - we have a roof... ... and shingles - just in time for a few days of rain - again. I've lost track of the dates, but this was early March. 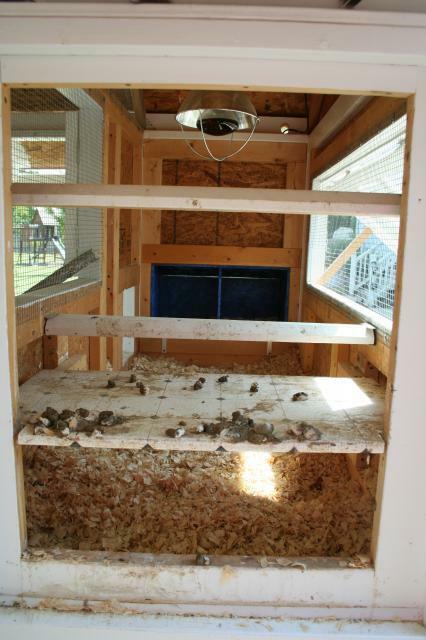 Looking in from the "human entrance" to the run - we have floors in - top for coop, bottom for storage. Top floor is covered with linoleum flooring for easy cleaning. 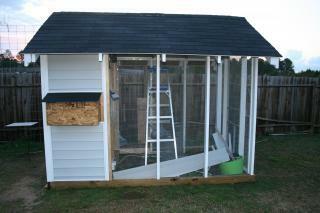 Large opening is for big 4 pane window I salvaged years ago - want the chickens to have a view of the garden! So I took my son to California March 17th to the 22nd to visit his grandma - meanwhile back on the "farm"... I came home to this! Hubby needed some alone-time to get some work done and all I can say is "Woo Hoo!" I think we're in the home stretch. Time to get some chickens... but that is on my other page. Check 'em out! 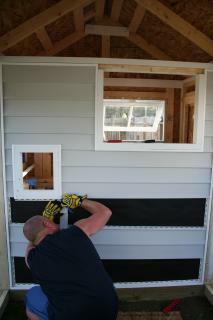 Vinyl siding to match out house, pop-out nest box (gotta figure out how to cover it! 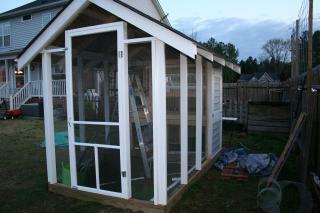 ), window installed, storage doors built & installed and clean-out door built and installed. 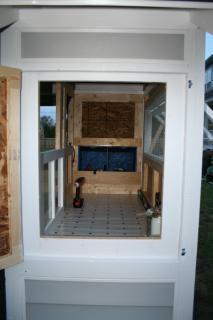 This is the back wall with window and storage doors for space beneath coop. Screen door reinforced with hardware cloth installed on spring hinges barrel-bolt closures at top and bottom. View looking in the clean-out door. Enough room to get a big wheelbarrow between the coop and fence and nice and close to my compost bin. Vinyl flooring, two 12x12x12 nestboxes on opposite wall. I had to get to work and in the last week since i've been home, I got all the hardware cloth installed with screws and washers, and a few poultry "staples" hammered in here and there for extra security. 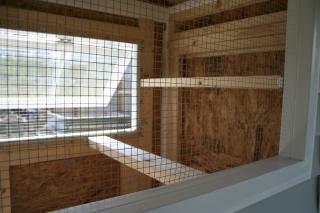 This is looking inside the run - the top of the coop is hardware cloth on the run-side for ventilation. 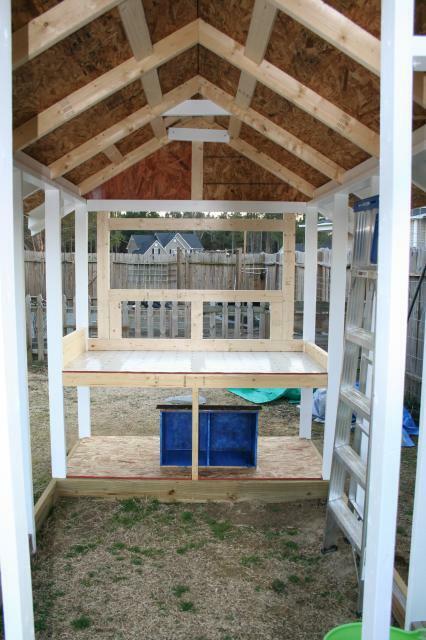 It will have a solid cover for winterizing to keep the chill out. 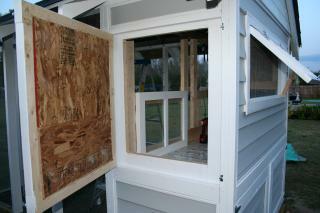 The large framed hole on the right is for another window that will open into the run. The pop-door is lower left just out of the picture (under the hand broom). DH completing the interior wall. Pop door to the left, another big 'ol ventilation window to the upper right. 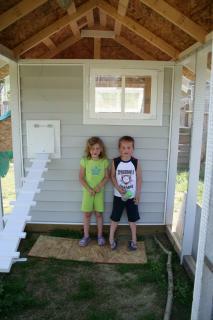 My two helpers - my son Logan & his friend Mackenzie, and the completed interior wall! YEA!!! 99% finished. 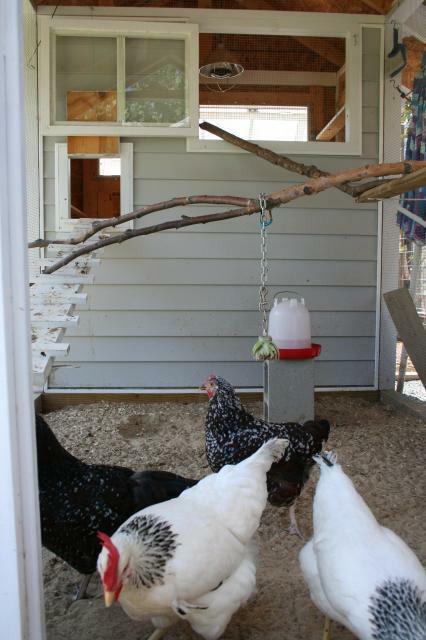 Coop in use with poop board - under my roosts. Love the ease of cleaning - open the door and scrape it right into a bucket! 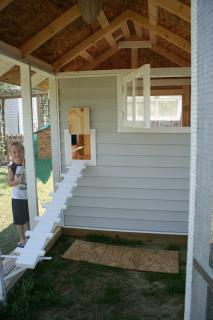 It is installed on 2x2's and can be slid forward into the coop. It also removes for easy cleaning. It is covered in vinyl flooring so I usually just scrape it with a drywall taping knife - 9" wide does the trick in no time. Takes a minute to get all the poo! Lovely dark blue painted interiors on their nest boxes you see on the opposite wall. The girls like and share the two boxes. If there is an egg in one, all the girls will lay in that same box. Go figure?!? 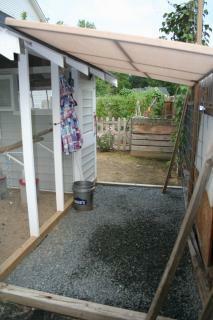 Newly graveled in and shade cloth covered side of coop/run. I got tired of trying to mow through here, although the chickens liked the clippings getting blown their way. My compost pile is 10' behind the coop. This graveled in area is where the new chicken waterer will go (in the shade). That's on another page. This side is fabulously covered in hyacinth bean vine and shades the West side of the coop and run from the hot sun all summer long! The coop interior - finished. The girls have a nice ramp from the pop door to the run. The pop door stays open 24/7 so far. They have a nice roost on the West wall, and a y-shaped Birch tree branch they use to do their tight-rope walking. Overall they are happy healthy birds. The girls are doing great! We're getting between 2-4 eggs a day, more than we can possibly eat. The girls are thriving and healthy... a few plucked feathers here and there led to an expansion of their run earlier this spring. 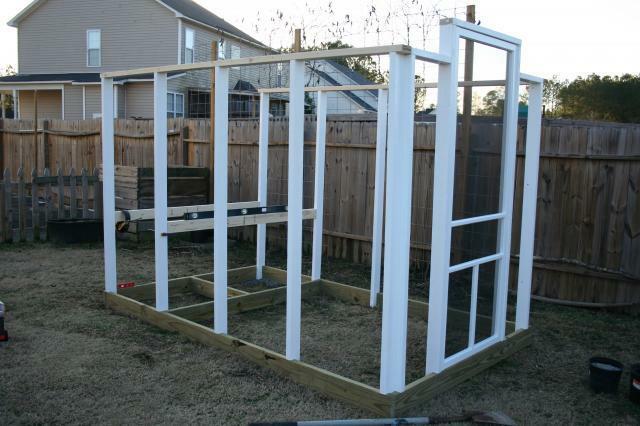 Enclosed by the 6' wood privacy fence on one side, the other sides are wood and wire fencing. The girls made short work of clearing out everything that resembled something growing. Yes, those are Christmas lights. 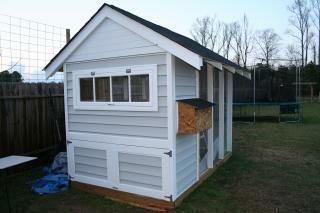 These are the newest pictures of the coop and extended run area. They now have a "sun run" as well as their shade run. I planted it in with "strayberry candy" daylilies, blue iris, and pink dianthus, and an "ice star" shasta daisy. Has to look nice because this is the view from my back porch - just about 30' from my house. Please feel free to PM me if you have any questions on the build, plants or the yard in general. lifeonblueberryhill and FlappyFeathers like this. 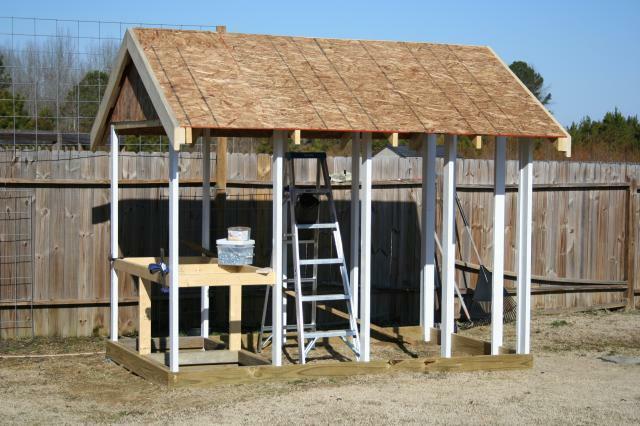 "Plans and Material list Needed"
This is a very nice well designed coop and run. The pictures throughout the process were helpful. The only thing this article is missing is the plan and materials that were used. 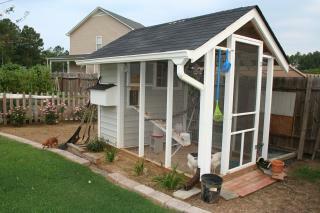 It would be helpful for anyone on BYC that would like to build a similar coop in their backyard. Nice. Well planned and well built and to boot easy on the eyes. I love the detail of the finials on the gate posts and the garden along the run. Beautiful. A nice way to start the day, reading your write-up and seeing your pictures whilst sipping a cup of java. oh ya...a bouquet to "DH". This is adorable. I love it!!! I love the outdoor run fencing. WOW! That is a really nice coop : ) Good job, and great set up. Nice job! Love your setup! I absolutely love your coop! Love it. Any more pictures? Very nice! I love the ceramic/faux chickens in the flowerbed! CUTE! Very nicly done. Your coop is nicer looking than my house. I'm so jealous! I thought my coop was pretty good, but now I want yours. Thanks for sharing. A truly beautiful piece of work! Thanks for sharing. You've expanded my vision of what to build....dang it! Very nice.. thanks for sharing. I am starting to consider a poop board.. I've picked your coop to show my husband... I want one similiar to yours. Nice job, love the xmas lights!! did you guys buy the windows or build them yourself? 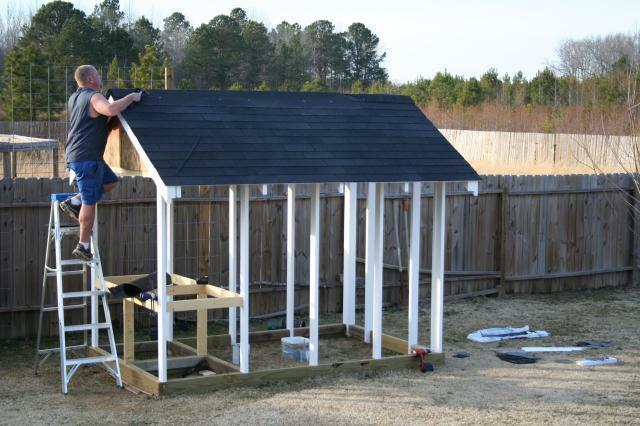 Very nice coop! 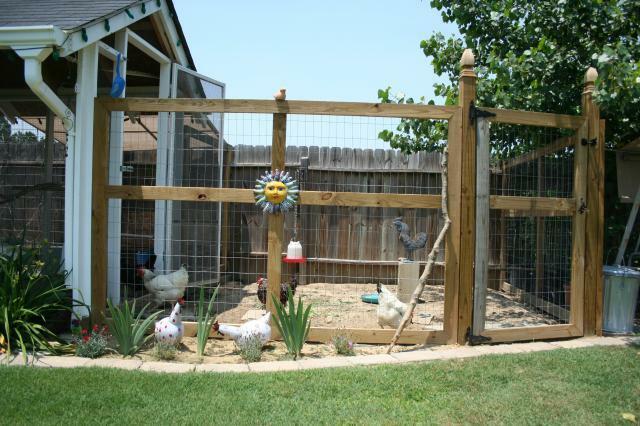 I am going to use some of your ideas mixed with a few others to ATTEMPT to build my own "hen hotel". My husband also was very against the chicken idea....he has finally succummed...guess it wasnt a happy life with the UNhappy wife! Very smart planning a trip and leaving the husband home. Nothing else to do so the coop gets done! I might use that as well! Thanks for posting!